Dollar Sign Stress Reliever takes away money worries. Dollar stress ball is a great giveaways for banks, car dealerships, real estate. Dollar Sign Stress Reliever is used for saving money or using it to make money. 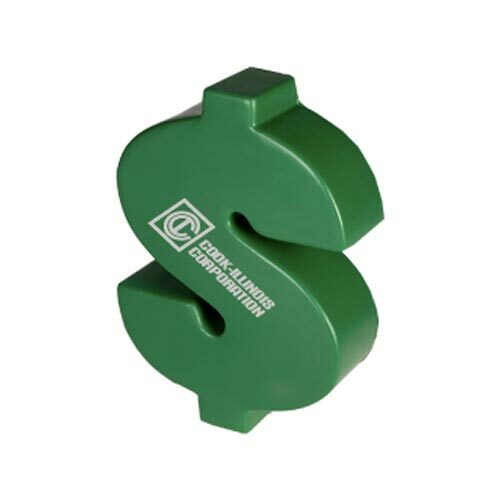 Get your money's worth with this dollar sign shaped stress reliever!Measuring 2 1/2" x 3 1/2", this item is a great promotional giveaway for banks, financial companies, trade shows, seminars and conventions. It's perfect for alleviating stress at the office. A silkscreen imprint is provided for you to customize this stress reliever with your company logo. With a lifetime guarantee and a supplier that is QCA certified, this product is a worthwhile investment. Squeeze and relax! Bulk / 17 lbs / 250 pcs. / 16 x 20 x 16box.